FULL DESCRIPTION & DETAILS OF LINER NOTES: https://store.cdbaby.com/cd/josevalentinoconbennymal ALBUM on YOUTUBE: https://www.youtube.com/watch?v=XBchrZd8Y60&list=PL0NLPYBPw2wAnLvT7tgDi7SZ3n7RauEbN ________________________________________________________________ New Album Release: Latin Jazz Album!!! 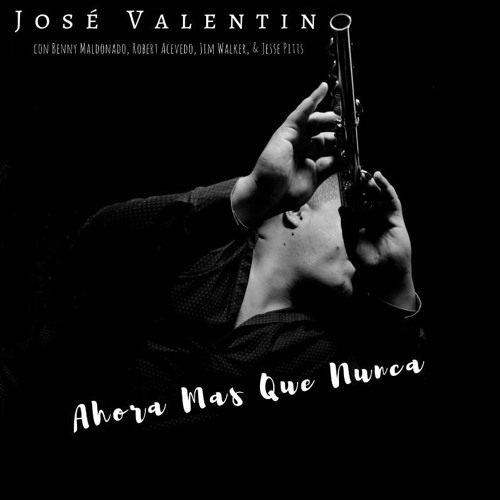 Acclaimed multi-instrumentalist, educator, & composer, José Valentino, returns to the recording studio to document a set of nine original compositions & two arrangements with the impetus to create a musical manifesto encouraging Latinos around the world to embrace, celebrate, and showcase the richness and beauty of their cultures; hence the title, "Ahora Más Que Nunca." There is much to celebrate about being a Latino, especially when residing in the United States of America. "Ahora Más Que Nunca" (Now More Than Ever) encourages Latinos to flaunt their God-given strengths, talents, competencies, and artistic expressions, as well as their love towards others in order to tear down any cultural misconceptions that would otherwise impede the unification of our nation. All in all, this album is sure to entice Latin jazz music lovers to reminisce, dance, laugh, cry, and celebrate. "Ahora Más Que Nunca" has music for everyone. Valentino carefully selected four musicians - three percussionists and one flutist [i.e., Benny Maldonado, Robert Acevedo Jr., Jim Walker, & Jesse Pitts] - to guest solo throughout the album - due to their profound friendships cultivated over the years; friendships that began as mentor-to-mentee relationships. Flute and percussion solos prevail throughout the album purposefully to represent the indicators of human life - heartbeat (percussion) and breathe (flutes). It is an album that celebrates the history, currency, and future of the genre of Latin jazz, as well as the people and cultures that have made it to be what it is today.